Established in 1928, Goliath was known as a builder of utilitarian three-wheeled trucks and small cars, but reimagined itself after the ravages of WWII. The GP900e was introduced at the Geneva Motor Show in 1950, and was constantly revised and updated during its lifetime. 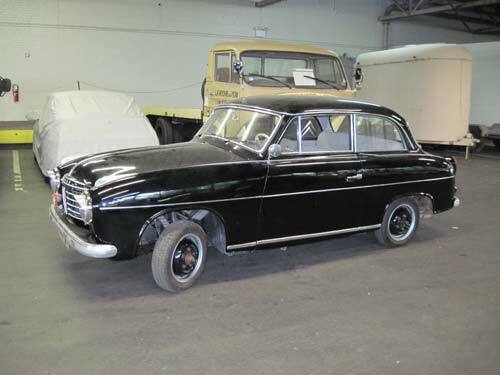 The ponton-fendered, 3-box design was perceived by the press as more modern and bold than offerings from either Opel or Mercedes-Benz. The novel placement of the small engine, atop the gearbox and transverse in the engine bay, allowed seating for five in a wheelbase of only 91 inches. This was a revolutionary idea, and copied by almost all major manufacturers in the years to come. In addition to the new layout, the GP900e was the first gas-powered car to offer fuel injection to the public, a feat often, but mistakenly, attributed to the Mercedes-Benz 300 SL. The Bosch mechanical system was first offered on the Sport in 1952, but almost immediately adopted across the range – another Goliath innovation quickly seized upon by others – as was the all-synchro 4-speed gearbox. In Europe, the Goliath was seen as a direct competitor to upmarket brands such as Mercedes-Benz and Opel; abroad, it was seen as very much an enthusiast’s car, well-built and innovative. According to the Goliath Veteranen Club, only five GP900s are known outside of Europe! Manufacturer: Goliath-Werke Borgward & Co. Original Cost: DM 6420 (1950); DM 5115 (1953) (US $ 1218) – price went down with volume!